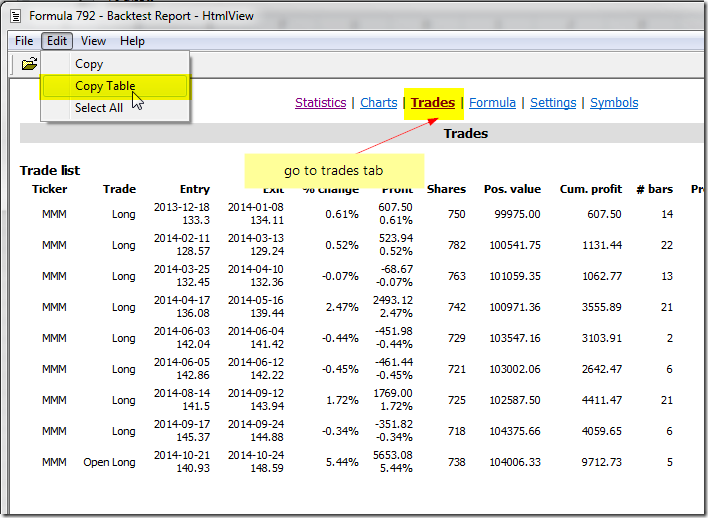 There are several ways to transfer the backtest results to a spreadsheet. Immediately after the test we can just click on the results list with right mouse button and choose Copy from the menu. 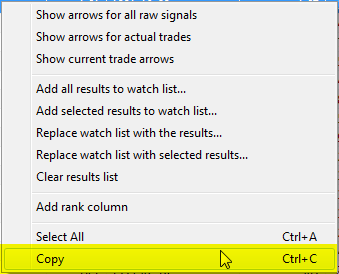 It is also possible to click on the results and use Ctrl+C key shortcut. The operation will copy the entire list, so there is no need to select all rows manually. 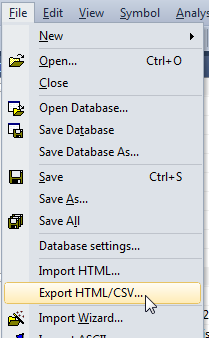 After the test, we can also use File->Export option from the main program menu to export the results list to a CSV or HTML file, which could be opened from Excel later on. Unlike the regular Copy option, Copy Table transforms HTML tables into CSV format and copies it into clipboard so tables can be pasted easily to Excel. Also it divides Entry/Exit columns into separate Entry/exit date/price columns.